What does it take to be rich? Do you need to work so hard you pass out? Do you need to screw people over and take advantage of every opportunity? Do you need a million dollar idea? You just need to change your thoughts about money. And I’m not just talking about stopping worrying so much. I mean literally changing your fundamental perspective on money. The one thing that all billionaires have in common is that they all see money in the same way. They see it as a resource there to be won. If you want to earn lots of money, you need to change the way you think about your finances. It has been scientifically proven that negative beliefs stop us from making money because the mind intentionally sets out to proof your beliefs accurate. For instance, if you believe you are unlucky with money your mind will make that belief a reality. In other words, if you believe you are poor your mind will intentionally look for ways in which you truly are poor. (Read the link above for the proof on this one). To make money, change your thoughts. But how? If you have negative thoughts about money, you need to change them. But how? How in the blue hell do you change the way you think about money? After all, your idea of what money means is personal and deep. How could you ever change it? Self-made millionaire Steve Siebold, who has interviewed 1,200 of the world’s wealthiest people during the past three decades, says that getting rich often has less to do with money and more to do with mentality. That’s why he wrote the classic How Rich People Think [AMAZON] , which is one of the most widely read self help books on finance. Siebold argues that the amount of money you have is the result of the way in which you think about money. So with that in mind I would like to make a statement. You have chosen your financial reality. Your subconscious mind has decided for you whether you are to be rich or poor. The subconscious mind is the most powerful part of the human mind. It is the unconscious force that motivates our every move. And it has the power to make us broke or to manifest wealth and abundance. So in a very real way, you have decided to be rich or poor. How does that statement make you feel? Do you agree with it? Probably not. Does it make you angry? Probably. The vast majority of people who do not have money believe that they are a victim. Maybe they were too generous. Maybe they were simply the victims of this unjust world. Maybe they were born without money and have never had the opportunity to make money. But it couldn’t possibly be that we all have precisely the amount of money that we told ourselves we could have. That couldn’t possibly be the case. Could it? Sure, we’ve all read Norman Vincent Pearle and we know the idea that if you “change your thoughts you’ll change your world”. But that’s just romantic wishy washy woo woo gunk, isn’t it? I mean, if you truly believe that money is the root of all evil, it only makes sense that you would repel money. You wouldn’t want money because you don’t want evil. (and if you do think this, please remind yourself that there are million of rich people who practice ethical investing, using money for good). And if you believe that you’re poor because you’re not materialistic and you’re not shallow enough to chase money, then you will always remain poor simply to prevent yourself from being materialistic and shallow. There actually is some logic behind the idea that thinking makes it so. It isn’t the voodoo-hoodoo idea that thoughts literally create reality out of thin air. It’s that our thoughts manipulate our actions, and our actions change our reality. If you hate rich people, for instance, you will not want to become one of them. Logic. Tour thoughts influence your actions, and your actions determine your reality. Therefore, if you do what they do in business and cut out the middle man, you’ll see that if thoughts = action = reality, then thoughts = reality. So to change your reality you really do need to change your thoughts. To make more money, think differently about finances. Okay. It can be hard to love rich people. They gloat. A lot. And lots of them are egotistical. But if you want to be a rich person, you have to love rich people. Jealousy will mess you up. It’s that simple. If you’re jealous of rich people you will probably hate them. And if you hate rich people why would you ever become one? Why would you become something you hate? If you want to become rich you have to change your thoughts about rich people. You have to start loving rich people. Because what you love you attract into your life. So how do you learn to love rich people? Well, you can get to know a few. Maybe you can research all the good they do with their money. But in my opinion, the best thing is to practice Loving Kindness Meditation. It’s a fantastic meditation technique that will make you more compassionate. Give it a shot. If you want to change your thoughts about money, you need to know what your thoughts about money are. In other words, you need to be self aware. By being self aware you can learn about your thoughts, and once you know your thoughts about money you can start to change those thoughts. The vast majority of people hold deep-seated prejudices, negative thoughts are so ingrained in their minds they are barely even conscious of them. We need to change our negative thoughts. In my experience the best way to change your thoughts is through Insight Meditation. This type of meditation is all about observing your thoughts and then removing them from your mind. If you feel negatively about money, the link above will make you more conscious of your thoughts so you can change them. If you want yourself to make money, you have to believe that you are worthy of making more money. Self worth is worth more than gold. Self worth manifests in wealth and abundance. To make more money, make yourself believe you are worth more money. To do that, try these techniques for self worth. The best way to land a high paying job is through word of mouth. Surveys show that 70 percent of high paid jobs come by word of mouth . You want employers to know or to hear about you on a personal level. That’s where the vast majority of high paying jobs come from. But of course, if you want people to know about you you have to get out there and make people know about you. Network. Get out. Meet people. Make a damn good first impression. Make the other person think “I could use a person like this”. Then they’ll naturally want you to work for them. For many people (including me) successful networking begins with the success mentality. You have to believe that you are worth money, that other people want to work with you, that you are valuable, and that is all a matter of your way of thinking and your mindset. If you spend all your time worrying about money, you’ll be too negative to recognise the positive opportunities in your life. We all worry about things. Which one of us, for instance, has never worried about the future? When you worry your mind gets full of thoughts and those thoughts seem incredibly important. We don’t need to make ourselves unhappy by worrying about money all the time. Try this simple exercise to stop worrying about money. Bring to mind an image of your current financial situation. Describe the thought you’re experiencing. Now, this is the important bit. When you described the thought you were experiencing you probably said something along the lines of “I am seeing my bank account with no money in it” or something similar. In truth, you’re not seeing your bank account, or whatever you think you are seeing. You’re just seeing an image in your head. When we think, we tend to confuse our thoughts with reality. We think (for instance) “I cant make money” and then believe that this thought must be true. In fact, it is only a thought. Say to yourself, “This is only a thought”. Now change the thought by using mental contrasting. Bring to mind the worst event that could possibly happen (e.g. having the debt collectors at the door). Now create a simple plan that will prevent the bad thing from happening. This is a simply psycholocial technique that has been proven to significantly reduce worry and anxiety. When you stop confusing your thoughts for reality you will stop giving your thoughts too much power. This is the best way how to stop worrying about money. Continually remind yourself that a thought is just a thought. It is nothing more. Stop dwelling on your thoughts and they will disappear. The next time you worry about money, just say to yourself “This is only a thought. It is not reality.” Try this for two days and I guarantee you will stop worrying about money. This, however, is just one way to stop worrying about money. Obviously you want to become rich fast, but for what ? You’re probably thinking life will be great once you are rich, and you are half right. If you knew how to become rich you’d be able to live easily, or travel all the time or buy jewellery or… well, whatever it is you want from money. Read: What makes you happy in life: money or experience? Your motivation for getting rich is probably about more than just cold hard cash. You want money for a specific reason, and in order to get money, you need to know precisely what that reason is. What is it money will allow you to do? What is it money will allow you to be? Let me help you out here by providing you with my own answer. This is my answer. You’ll have your own, and it is vitally important that you work out right now exactly what it is that you want, because if you cannot even express coherently and precisely what it is that you truly want, you will never get it. So, to get what you want, you need to know what it is you want. And if you want to know how to become rich fast, you need to know why you want money so much. When you identify with your true reason for wanting to not be poor / wanting to be rich you find personal motivation. This motivation will push you to succeed. 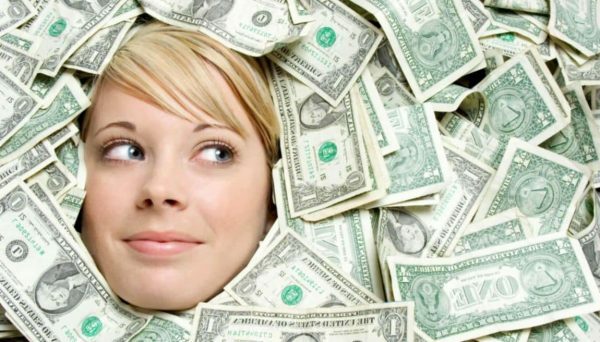 The vast majority of people in the world who actually do get rich quick, are hugely creative. Of course, you can get rich quick by investing money in the stock market. . . IF you already have money to invest. You can get rich quick by getting a very high paying job. . . IF you’ve been working in an industry for years or if you’re a silver spoon or happen to have the right connections. But what about the rest of us? How can we possibly go from where we are to being rich? We can only possible achieve that if we are creative. Think about people who have gone from being poor to rich. The majority of them either invented something (which means they were creative), or they somehow managed to convince the right people to give them a break (which also requires a lot of creative intelligence). Creativity is the key. You need to create wealth. Therefore, you need to be creative. Thankfully, we’ve gone right ahead and created a guide to how you can become very very creative in a short amount of time. This will unleash a new side of your brain and help your to get rich quick. Click the HOW button for more on this. There really is a money mindset. And it can make us rich or poor. To change your finances, change your perspective on money.